The Carnaval Forever slot from BetSoft is a beautiful representation of the massive, traditional, Carnaval celebration that goes on all over the world once every year. There are different people in different places, each with their own unique take on just how the celebration should go, but one thing remains the same everywhere — it’s a massive party meant to be enjoyed to the fullest by everyone and anyone who cares to participate. Carnaval Forever is a bright and brilliantly designed five-reel, three-row video slot with ten fixed pay lines. There are five high paying symbols, five low paying symbols, and wild and scatter symbols. High paying symbols are made up of beautiful Carnaval dancers. The highest paying regular symbol will bounce back 75 times your bet for five of a kind, but landing five wild symbols pays out 100 times. The lower symbols are made up of playing card values ten through ace and the lowest paying will give you back five times your bet for matching five. This slot appears to be a high volatility slot, so you can expect a bit of a roller coaster ride as far as your balance goes, but there are certainly some big payouts waiting on the reels in this game. Regular payouts are quite generous along, but when bonus features hit, the amounts can get extreme. On top of that, there’s an option to gamble the award on any winning spin to double some or all of your payout with no limit on how many times you can do it. Setting up your wager on this slot couldn’t be any easier. There are seven preset wager amounts ranging from £.10 up to £10 per spin. All you’ll need to do is select the amount that you’d like to play with and the game is ready to go. This slot really captures the spirit of Carnaval and is designed beautifully. The background is extremely detailed and the symbols on the reels are big, bright, and colourful. 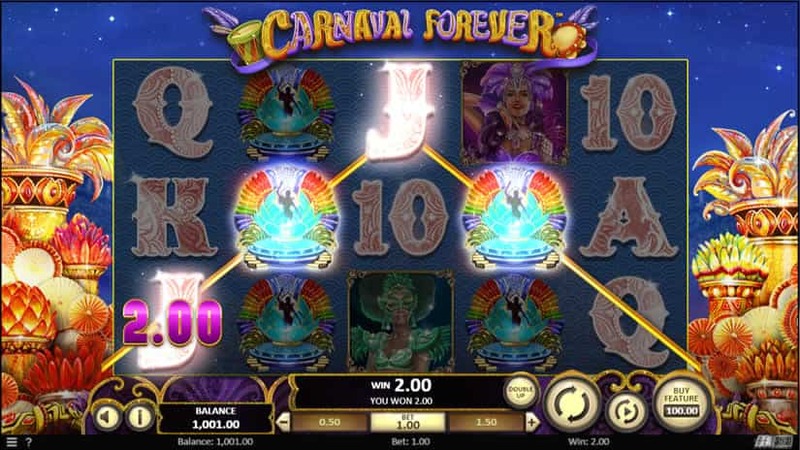 Carnaval Forever is obviously a high volatility slot, so it takes some patience, but with such high symbol payouts and the possibility of big bonuses, the potential for huge prizes makes it worth sticking around and playing a few spins. This slot is very accessible for even the smallest bankrolls with a low minimum bet of just £.10. It’s the perfect slot for more conservative gamblers who’d like to experience the excitement of a high volatility video slot machine with high payouts. The return to player rate (RTP) for this slot is 96.22%, which can be considered really good. The low minimum bet also comes with a very low maximum bet that might not provide enough excitement for high-roller players who like to risk more on their games. Although bonus features on this slot can lead to impressive payouts, the features are limited. For those who like lots of features or interactivity, Carnaval Forever probably won’t tickle your fancy. There is a buy-in feature that will let you buy directly into ten free spins for 100 times your current bet. This is undoubtedly a bad bet to make. Spending £100 to play ten free spins with a £1 bet will leave you in a position where the amount you need to win to get a profit is insane. You’re basically paying £10 per spin to get paid as if you only spent £1. You’d do better to just keep betting £1 on regular spins and let the free spins trigger naturally. There is really only one big bonus feature on Carnaval Forever and that is the free spins. BetSoft did a good job of boosting the feature to create good payouts and plenty of excitement around that feature, however. The Carnaval Queen serves as the scatter symbol on this slot and it’s possible to land up to five of them on the reels at one time. Getting three, four, or five of the Carnaval Queen will reward you with five, seven, or nine free spins respectively. What makes the free spins on this slot so special, though, is that every one is guaranteed to be a winner. You’ll also get two additional free spins for any addition scatter symbols that land. It becomes possible to get quite a bit more than your initial lot of free spins and watch the prize money really rack up. As was mentioned above, there is also a buy-in feature that will allow you to buy directly into the free spins feature. During the base game, there are coins that will appear randomly on the reels and discount the buy-in price. It will take quite some time to get that buy-in price down to a reasonable level, but according to the game instructions, it is possible to actually zero it out and earn another bonus. Also, depending on how you look at it, it might or might not be a bonus feature, but there is also a double up option that allows you to gamble some or all of your prize after a winning spin. If you choose to go for it, you’ll be asked how much you want to wager on this double or nothing bet and then pick heads or tails on a coin. If you pick correctly, you double your money. It’s that simple. Betsoft is one of those casino software companies operating all around the world. You can find Betsoft games in UK online casinos, as well as their Australian and USA counterparts. And one thing that is really impressive about these online slots, is that their visual effects are amazing. This is one of my favourite software providers, by far. Yak Yeti And Roll slot.